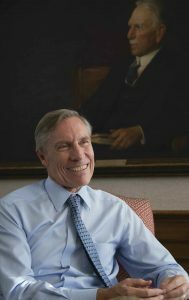 Thirteen years ago, as David Oxtoby was preparing to become the ninth president of Pomona College, this magazine introduced him to the College family with an article titled “The Elements of a President.” The title arose from a reference to one of his favorite books, The Periodic Table. In my mind, he was a guy who thrived on opening new doors, and who didn’t shy away from difficult situations. He really believed in my potential, and he reminded me of that constantly. In this autobiographical work, Italian chemist and Auschwitz survivor Primo Levi famously titled each chapter with an element that he had worked with as a chemist or that was related in some symbolic way to his life. Asked which elements he would choose to describe his own life, Oxtoby—as a fellow chemist with a similarly figurative turn of mind—played along. He started with hydrogen, the first and simplest element, symbolizing his formative years. Next came gallium, an element with some odd properties that interested him in his research on nucleation, as well as being named in honor of France, the country where he met his wife, Claire. Chlorine, bromine and iodine, all part of the halogen family, represented his three children. All, he said, were part of a single family and yet each was utterly distinctive in character. To symbolize his years of teaching and research in atmospheric chemistry, he chose carbon, the key element for life. Finally, for his arrival at Pomona, he selected element number 47 on the periodic table, silver. So naturally, as Oxtoby’s tenure as Pomona president entered its final months, we went back to him to ask how he would revise or add to that list today to characterize his presidency. Once again, he played along, and the result is a metaphorical reflection on some of the key themes of his transformative tenure at Pomona. David is not only a renowned scientist, but a powerful advocate for the arts. I remember him telling us that our job was to do what was right, not what was popular. Some aspects of a presidency are easily quantifiable—gifts raised, buildings built, programs launched. Others, though equally important, are harder to measure. David Oxtoby’s role as an international ambassador for the liberal arts falls into the latter category. A chemist who had spent his entire career up to that point at large research universities, Oxtoby began his inaugural address with these words: “What is a liberal arts college today, in 2003?” He went on to make the case for an education that is broad, personal, and full of opportunities to follow one’s passions. That infectious passion was apparent as the years went by, and Oxtoby became a national spokesperson for the continuing importance of liberal arts colleges, writing and speaking about the future of the liberal arts and its response to such challenges as the growth of interdisciplinary study and globalization. He even carried his message around the globe, traveling to India, Hong Kong and Singapore to offer support to local educators working to adapt the successful American liberal arts model to their own cultures while learning from them in exchange. “Given the ongoing debate here at home about the value of a liberal arts education, it was good to be reminded that we’re all part of an international competition in which U.S. higher education is considered the gold standard, in large part because of its breadth and multiple pathways, including a vigorous liberal arts tradition,” he said in a letter to alumni. While promoting the liberal arts tradition nationally and abroad, Oxtoby also focused throughout his presidency on reinforcing it here on our own campus. He worked with the faculty to restructure Pomona’s overly restrictive general education program to give students more freedom of choice. He led a campus-wide renewal of Pomona’s commitment to the arts, including the construction of a new Studio Art Hall that is now inspiring more students to explore the arts. In the final year of his presidency, he is continuing this work by spearheading the College’s ongoing initiative to provide the Pomona College Museum of Art with a new home suitable for a state-of-the-art teaching museum for the 21st century. I think President Oxtoby is probably one of the most outspoken leaders on college campuses when it comes to sustainability. I’ve always been inspired by his deep commitment to fighting climate change. As a noted atmospheric chemist who taught classes in environmental chemistry throughout his presidency, Oxtoby brought an expert perspective and a degree of credibility to the topic of sustainability that few of the nation’s college leaders could match. His record in promoting sustainability as a shared, campus-wide commitment began early in his presidency with his involvement in strengthening the still relatively new Environmental Analysis Program and preserving of the Organic Farm as an officially sanctioned part of the campus. Completed the year after his arrival, the Richard C. Seaver Biology Laboratory became Pomona’s first building to earn a LEED certification (silver) from the U.S. Green Building Council. That, however, was only the start. Over the following 12 years, with a commitment by the Board of Trustees to sustainable construction of all new facilities, the College would complete four new academic buildings, two new residence halls, and a three-building staff complex, all LEED-certified at the gold or platinum level. Even the College’s new parking structure, in a category of buildings that doesn’t qualify for certification, was built to LEED gold standards. Numbers never tell the whole story, but sometimes they make for a good starting point. In 2003, the percentage of students of color in the Pomona student body stood at 27%. Today, 48% of Pomona students are students of color, making Pomona one of the most diverse liberal arts colleges in the nation. Over the same period, the College’s international student population has grown from 2% to 12.5%. I believe our students will reap the benefits of his leadership for decades to come. What struck me about David when I first met him was his deep personal humility. Among other things, that meant building strong partnerships with such organizations as the Posse Foundation and Questbridge, which now serve as conduits for highly talented students from underprivileged backgrounds across the country. The College has also built its own program to help promising high school students from the College’s own backyard prepare themselves for success at top colleges. Today, the Pomona College Academy for Youth Success (PAYS) still holds a perfect record in gaining its graduates admission to four-year colleges and universities, including Pomona. Internationally, the college not only stepped up recruiting in Asia; it also expanded its range into South America and Africa. By extending more financial aid to international students, the College also succeeded in broadening the demographics of international students to align with the College’s goal to make the college accessible to the most talented students from all backgrounds. In 2008, under Oxtoby’s leadership, the College also made the commitment to treat all applicants who graduate from U.S. schools the same, whether or not they are documented, thereby enabling undocumented students to compete for admission and aid on a level playing field. You could see in his eyes that he cared a lot about the Sontag Center. That’s David’s gift, to engage with things differently and to expand ideas. The central theme of the Daring Minds Campaign that was launched in 2010 and completed in 2015 was condensed into one five-word sentence at the start of Oxtoby’s address at the campaign launch: “The world needs daring minds.” Pomona, he said, must be a source for global citizens who possess not only the knowledge and understanding to give them mastery of their field, but also the creativity and intellectual daring necessary to use those resources to make a difference in the world. Out of that campaign, which raised a total of more than $316 million and changed the face of the College in significant ways, came a series of initiatives designed to challenge students to create something new or to pit their knowledge and problem-solving skills against problems in the real world. For instance, Pomona’s new Studio Art Building provides a state-of-the-art facility for the creation of art in an inspiring and rigorous setting, while the new Intensive Summer Experience program expands opportunities for students to spend a summer in research or an internship and provides funding to ensure that all students, including those whose families depend upon their summer earnings, can afford to take part. But perhaps the most inventive expression of Oxtoby’s focus on nurturing daring minds came at the close of the Daring Minds Campaign, with the creation of The Rick and Susan Sontag Center for Collaborative Creativity. Though housed at Pomona, this innovative new program—designed to give students a setting in which they can hone their creative ability by combining their knowledge, energy and creativity with those of other students and faculty to take on complex, real-world problems that require collaboration across disciplines and innovative thinking—also reflected Oxtoby’s longtime commitment to collaborating more closely with the other institutions of the Claremont consortium. Conceived from the beginning as a 5-college endeavor, today the Sontag Center brings together students from across the five undergraduate colleges of The Claremont Colleges to stretch their creative muscles in productive and instructive ways.